In the mid Sixties, Morocco is a country in doubt. The University has become the main scene of protestations against the power set up by Hassan II following the death of his father, King Mohammed V.
The hopes nourished by the combatants for independence left room to the vastness of the task to be carried out so that Morocco can leave its economic lethargy. The Kingdom is a prey to sharp dissensions within the political parties. Following the arrest of several militants of the UNFP in 1963, their leader Mehdi Ben Barka chooses the exile. The state of exception is instituted in March1965, following revolts of students bloodily repressed by general Oufkir. A true republican project is being formed on the benches of this Moroccan university and among these students, several are of origin sahraouie. For those students, it is not a matter of search of identity or a particular project for the Sahara; their ideals are more communist revolutionary and their differences are expressed by the portraits they hang in their students rooms each one going by its preference for Mao Tsé-toung, Lenin, Trotsky, or Fidel Castro. It’s the cold war, and the public opinion turn to the crisis of the missiles, the only conflict of the cold war which could carry out humanity to a disaster. A man, emblem of the Cuban revolution, has a particular project for the universalization of the revolution. He is since the Sixties the icon of a “romantic” revolution, where the ideas would count more than the power. Poor manager but ambitious, he is politely driven out by his accomplice of guerrilla, Fidel Castro after a few years in power. His name is Ernesto Che Guevara. The Project of Guevara passes by the Maghreb and he is the one who will theorize the creation of a movement of Guerrilla in the Sahara. In a book revelation, former Cuban spy Juan Sharp alias “El Magnifico”, tells how Ernesto Che Guevara conceptualized the strong axes which will contribute to the creation of the Polisario Front in 1963 when visiting Algiers. He also tells how revolutionary training camps will be gradually installed to endocrine the future guerrillas of the Front, and tells about their trips for “formation” to Cuba. Important Witness of this time of pretences, espionage, broken dreams, and aborted revolutions, Juan Vivès brings a priceless lighting over the genesis of the Polisario Front. It is in this very particular context that a clandestine movement of about fifty people is born to fight the Spanish occupant. This movement, MLS (Movement of liberation of the Sahara), will act clandestinely and will follow the whole revolutionary logorrhea of Guevara. The MLS leader and founder, Mohammed Sidi Brahim Bassiri, is a young Sahraoui who studied in Cairo and Damas, and who grafted to the revolutionary doctrines of Guevara the fundamentalist elements inculcated at the time of his theology studies and through his various contacts with the Moslem brothers of Egypt. He publishes a newspaper, “Al Chihab” (“the torch”). Mohammed Sidi Brahim el Bassiri died days following his arrest by the Spanish colonizer. The sahraouis students’ of the Moroccan university, in frontal ideological opposition with their pairs coming from other provinces, perceive the movement like an opportunity to carry out their revolutionary combat and to propose a project of society inspired from the communist model. For that they need a leader who materializes little by little in the person of El Ouali Mustapha Sayed, young medical student in Rabat of Sahraouian origin. He venerates the personality of Che Guevara and tries to follow his steps. 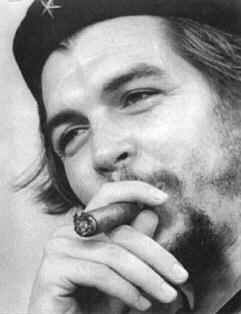 The imitation of Che Guevara goes until obsession for el Ouali, who cultivates his appearance of cursed revolutionist. This does not prevent him from making contact, at the end of 1969 with members of the party of Istiqlal, who sent him back to his dear studies. El Ouali will even knock the door of… the Royal cabinet in order to put forward his vision and to obtain funds to create his own movement. He is politely gotten rid of. Meanwhile, another movement of liberation, the MOREHOB (Movement of liberation of the blue men), aiming at federating the Touaregs while recognizing the legitimacy of Morocco over the Sahara, is bringing together more and more followers. This worries El Ouali who sees his project of revolutionary front taken away by Edouardo Moha, alias Mohammed R’guibi. Finding out that he could not obtain support from Rabat, El Ouali decides to precipitate the events. Taking over the elements theorized by Guevara in 1963, El Ouali Mustapha Sayed incorporates there the Islamist doctrines theorized by Mohammed Sidi Brahim Bassiri. He starts by creating his “Embryonic Movement for the Release of Saguia el Hamra and Rio de Oro”, then the Polisario Front (Popular Front of Release of Saguia el Hamra and Rio de Oro) on May 10, 1973 in Zouerate, Mauritania. The world is then living the agony of General Franco. At this time, Moroccan, Algerian and Mauritanians will begin secret negotiations to determine the fate of the Sahara. For Houari Boumediene most urgent is to find a strategic opening for the Iron of Dar Jbilet, which would not be profitable if it were to be conveyed in the north of the country and then join the Mediterranean. A project of morocco-Algerian mixed company is considered, several meetings are held between discrete emissaries. It is then decided that the port of Tarfaya would be refitted, and that a road axis, doubled of a railroad, would be set up from Dar Jbilet to Tarfaya. For King Hassan II, the marocanity of the Sahara is indisputable. These provinces are an essential component of the Chérifien kingdom, the red of the Moroccan flag brought by his alaouites ancestor’s being a more shingling demonstration. It is a formidable confrontation of the wills which is proceeding during the19 73-1975 years: Hassan II the Moroccan having legitimacy for him, and Boumediene the Algerian having a vital need for this opening towards the Atlantic. At this time, young Minister of the Algerian Foreign Affairs, Abdelaziz Bouteflika makes its entry in the Sahara file in the summit of the African Union held in 1972 in Rabat. At a dinner, the impetuous minister explodes when he learns that Morocco and Mauritania settled their disagreements and are to sign an agreement with Spain. It is too much for Bouteflika, who thought that Morocco, with which he maintains very tight relations, would have at least put him in the confidence. Bouteflika, who is somewhat scrambled with Boumediene, finds an occasion to rebound and wrote a memo of 10 pages addressed to his president. In the memo he says in substance that Morocco will not stop in the Sahara, but will cross the border to recover disputed territories. When two years later, his secret service announces to him that Morocco, presenting the death of General Franco, is preparing an immense peaceful march to recover the territories of the Sahara, Boumediene enters in a big anger. According to him, this march would ruin the agreement of creation of a Morocco-Algerian common company. However, the Moroccans never question this secret agreement, which would be advantageous to the two parties. What puts really Boumediene out of him is that the green march is a formidable opportunity for Hassan II to show his know-how of tactician, and to legitimate his position of mediator in the Middle East, which already started to outline at the time of the conference of Anfa. At this point Boumediene, decides to reactivate the “Guevara Doctrines in the Sahara”, and makes contact, through Kasdi Merbah, young boss of the secret service, with El Ouali Mustapha Sayed. Initially reticent, El Ouali Mustapha Sayed understands the party he can draw from the Algerian support. What he does not know yet, is that another intervening alerted by Merbah is making his entry and is particularly interested in the Sahara file: His name is Youri Andropov and he is the very powerful director of the KGB and future Soviet Union dirigeant. The Russian Master spy advises Merbah to proclaim without awaiting a republic in order to “place” the Polisario Front. Andropov wants to recover the few 3000 sahraouis demobilized by Spain, who consider that Morocco withdrew their livelihood. On February 25, 1976, a decorator of the Russian national company “Mosfilm”, Grigori Andriovitch, is dispatched to the Sahara to prepare the scenography of a declaration of independence. Problem: the young Polisario Front does not have enough members taught reading and writing to constitute a credible executive. It does not matter; the executive will count 9 members, 21 “Politburo” and 19 “basic committees of the people” “elected officials”. This imbalance has a simple reason: the Polisario Front counts nearly 600 members. Andropov and Merbah must urgently find a “reserve of growth” for the Front. Andropov thinks immediately of the 3000 men demobilized by Spain, and adds some forced recruitments of Mauritanians being located at the border with Algeria. There, Grigori, the decorator of “Mosfilm” has the impression to be on a scene of “Lawrence of Arabia”. He advises the members of the Front to take a serious posture. Then when El Ouali Mustapha Sayed began his short speech, the scenographer stops him. He has just realized that nothing was designed to greet the “declaration of independence”. He suggests that weapons are to be distributed and shots drawn in the air. After one hour of tergiversations, the men of Kasdi Merbah, who staged the operation, distribute some Kalashnikovs and white balls. El Ouali Mustapha Sayed can restart his reading, which will be again stopped by the Russian who realizes that the secretary general of the Front does not carry any shoes, a little ridiculous of any revolutionist who respects himself.